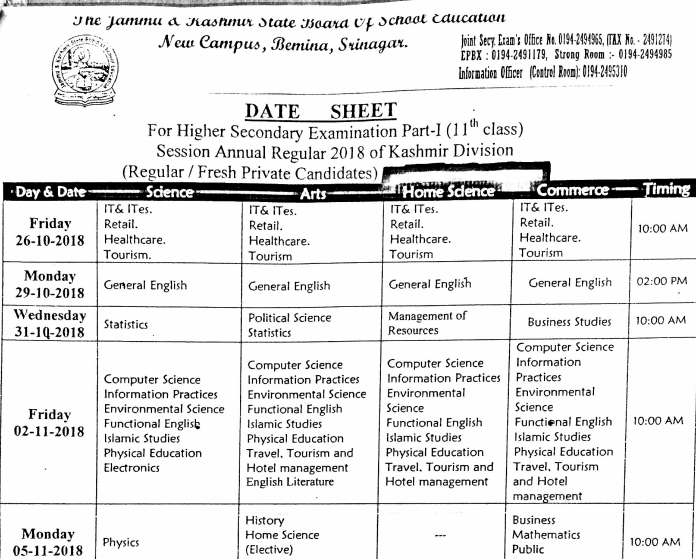 JKBOSE 11th Class Date Sheet 2018 Kashmir Division, Winter Zone – This Gandhi Jayanti, Board of Controller of Examinations and Evaluations, on 2nd October has already uploaded the PDF file for Date-sheet pertaining to HSE-I (Class 11th) Session Annual Regular 2018 (Regular/ Fresh Private candidates) of Kashmir Division (Notification Access Area: Datasheet). Direct link regarding the same is also given below. Three major instructions available for this test include – 1.) Examination centre has been specified on the Admit Card, 2.) The practical test shall be conducted immediately after termination of theory examination. 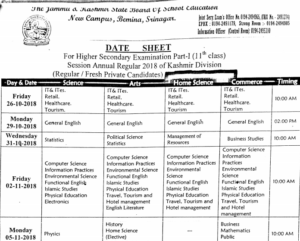 The concerned candidates shall contact respective heads of the institutions/ sub/ branch board offices and head office Bemina, Srinagar regarding the practical programme and 3.) – The candidates are advised to bring their Admit Cards/ Registration Cards on all examination days for verification.